My relationship with New York City is definitely one that can be defined as love / hate. I love the city, and the city hates me. No, I'm not being dramatic. I have literally had some of my best and worst travel experiences while visiting Manhattan, and again this week it reminded me that I have worn out my welcome. I've lost count the number of times I've visited NYC. In 2007, one of my closest friends left NOLA and moved to Brooklyn to embark on a new adventure. My visits started less than 6 months later, and occurred semi-annually in the spring and winter. A couple years after Abby arrived there she decided to attend art school and become a graphic designer. This is where my bad travel luck commenced. Upon her completion of the art program, there was a portfolio showing instead of a graduation ceremony. The stars aligned and I was able to book a cheap flight to JFK, putting me in town for 12 hours; long enough for me to attend the exhibit and return home for work the next morning. However, when I arrived in mid-town, I discovered that the subway system had been shut down. A pedestrian had decided to pick a fight with a train, and obviously the train won. The police investigation and 45 blocks stood between me and the gallery. Three cab rides and two hours later, I showed up in time to be the surprise guest for the after-show dinner. To this day I remember the frustration of being so close, but not knowing where to go or how to get there ... and the Black & Bleu Burger I had once I arrived. The next year started my foray in to marathon running, and the ING New York City Marathon was the first registration lottery I entered. In 2009, I think it was also one of the few races that had a field that could only be entered by lottery. That first year, I experienced the lottery selection day through an online stream, as well as the subsequent disappointment of not being selected to participate. I softened the blow by registering for the Chicago Marathon and Walt Disney World Marathon soon thereafter, but NYC was still on my list. 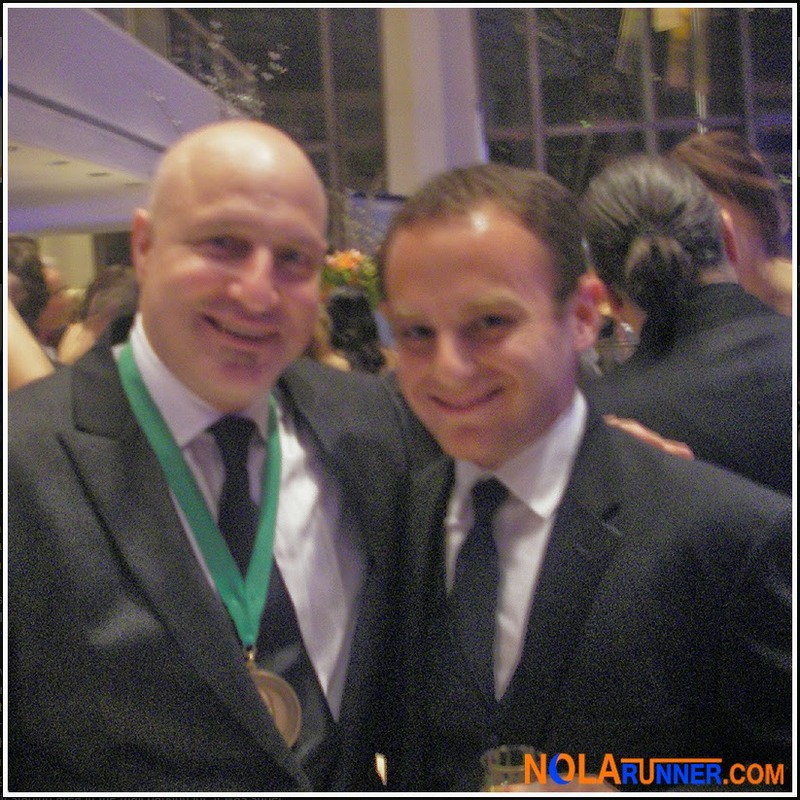 In May of 2010, a friend was attending the James Beard Awards at Lincoln Center. He was going for a work trip and attending solo. After finding out all of his invites could include a "plus one," this foodie tagged along. I was able to couple an Abby visit with a gluttonous once in a lifetime experience, making it a vacation I couldn't pass up. While in town, the three of us had the opportunity to attend a showing of the Tony Award winning musical "Next to Normal." After entering the theatre and sitting down in our front row seats, we found out that the show was being delayed and the facility was on lockdown. This was the occurrence of the Times Square bombing attempt, which happened about a block from the theatre in which we were stuck. A couple panic attacks, spilled red wine, and phone calls to home later, we left the theatre without seeing the show and got as far away from Broadway as possible. I still was able to enjoy a great trip there, as can be seen by this blurry photo of myself with Tom Colicchio of Top Chef fame, but the near death experience is hopefully the only one I ever endure. The year of 2011 found me locked out of the ING New York City Marathon with yet another lottery bonk. Nevertheless, I wanted to visit Abby, see the still-new Yankee Stadium, and eat my way across the island. I landed at JFK on the morning of August 23rd, and about an hour later while I was on an AirTrain headed away from the airport, an earthquake hit the east coast. After an emergency exit from the train, passengers were shuttled by bus back to the airport. I ended up having to hop in a van crammed full of 12 people to get anywhere close to the city. Subways and bridges were shut down in fear of structural damage, but we made the most of it. At least until the end of my week-long stay when Hurricane Irene made landfall at Coney Island. Again, the city basically shut down and we were stuck in Brooklyn. After being locked in an apartment with me for the better part of a week, Abby told me I wasn't allowed back until I got in to the marathon. Finally, 2012 was my year. 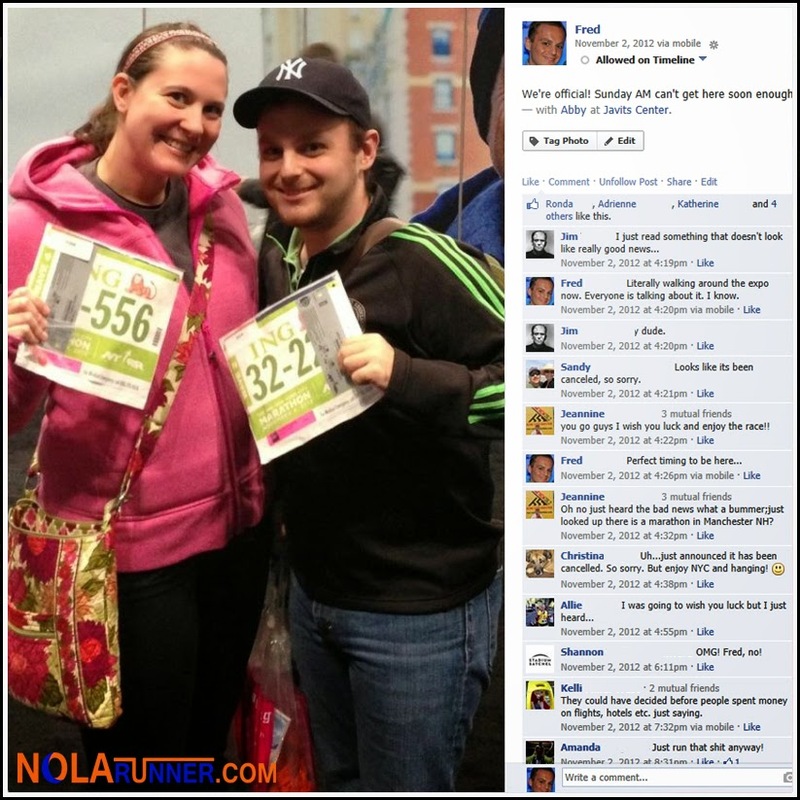 After three rejections from the lottery, I was getting to run the ING New York City Marathon. Abby was ready to run her first full, and we were stoked to do it together. The week prior to the race, Hurricane Sandy hit New York. The events that followed don't need to be rehashed, but all of the details can be read HERE. Needless to say, the elusive run through the boroughs still is on my bucket list. I haven't been back to New York City since that marathon trip in 2012. Fortunately, Abby and I still meet up in NOLA and other destinations for races; however, I've vowed not to run in the city until I get to experience it as a New York City Marathon participant. The rejections in 2013 and again yesterday for 2014 are discouraging, and further entrench my belief that I just have bad luck in the Big Apple. Now that the "three times and you're in" rule isn't in play, getting a bib for the race is that much more difficult. That's not going to stop my annual tradition of paying the $11 fee to purchase a lottery ticket. Maybe next year will be the one where I strike it rich. Thank you for reminding me of all those disasters I was conveniently trying to forget about. haha! 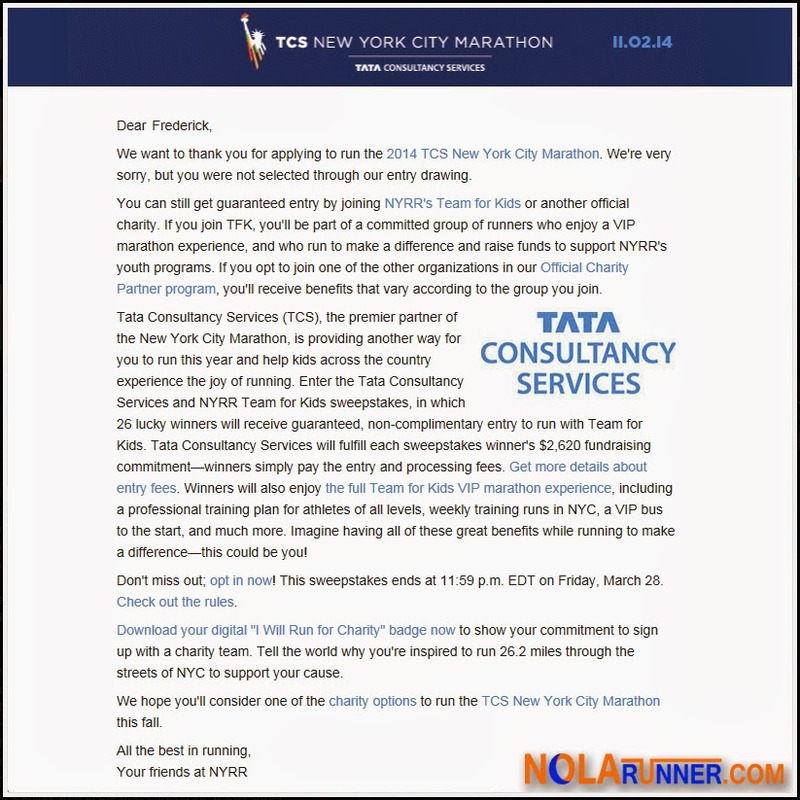 You really need to run the NYCHalf, too. If I hadn't just written this post, I wouldn't believe that I was there with you for all of these events. I really need to come with a State of Disaster warning for the city. It's amazing that Giuliani or Bloomberg did pass sanctions against me visiting.